If you’ve ever found yourself saying “I wish I could bike around the Delaware Bay, but I just don’t know how,” we’ve solved this problem. This summer you can do it using New Jersey Transit, your bicycle, the Cape May – Lewes Ferry, your bicycle again, maybe a DART Bus or two, and SEPTA. Talk about multi-modal transportation! Click here to view the map, which has the route as well as info on connector trails and sites along the way. Ride NJT AC line to Atlantic City. This line allows bikes at all times. Proceed immediately to Barbera Seafood to fuel up. If you like seafood, this is a must. Ride the many boardwalks (time permitting: most only allow bikes in the mornings) and Atlantic Avenues and Ocean Drives to Cape May. If the season is right, don’t forget to check out the bird sanctuaries. Google says this should take 4 hours biking directly, so this seems a reasonable day trip with the obligatory stops at sites of unquestionable cultural significance. “Bike Across the Bay” on the Cape May – Lewes Ferry. Bikes ride free! Take a short ride to Dogfish Head Brewery (on second thought, you might want to end your day here!). Ride hard to Killen’s Pond Waterpark, then relax just as hard. You can camp there too if you want to end your day. Continue north through back roads (lovely and flat!) to Spence’s Bazaar, known to locals as “The Sale.” If you don’t stop there for lunch you are doing yourself a grave disservice. It’s only open Tuesdays, Fridays and Saturdays so plan your trip accordingly. Trust me on this. Swing by Bombay Hook National Wildlife Refuge. It’s amazing (Also bring your bug spray). Hit the “beach” at the Augustine Beach Access Area. It’s just as romantic as its name indicates, but hey, it’s a cool off spot! SEPTA train back to 30th. SEPTA regional rail allows bikes at off peak times only. End your trip in Ocean City. Easy enough to get to, plenty to do, relatively affordable accommodation. End your trip in Lewes. This can be done in a regular weekend, or a relaxed-paced 3-day weekend adventure. You can thus save certain amenities on the shore for the return trip, like Barbera Seafood and the many great Mexican restaurants/bars along Arctic Avenue in AC (see map). Bonus is this part of the ride is pretty kid-friendly. Some of the bridges are not super fun, but most have sidewalks in addition to shoulders. Plus, boat ride! You can get this far without any gear whatsoever (save for water bottles), as there is a constant supply of accommodation, food, and bike shops along the route. Hop on a northbound DART bus from Lewes, Milford, or Dover (just don’t skip The Sale. You will regret it). You can (eventually) get to Wilmington from any of these towns, and several others. All DART buses have front-mounted bike racks like SEPTA buses. Feeling game? Here’s a link to the map we made. Post a pic of you and your bike on the ferry (or in Cape May if you don’t want to spring for ferry tickets) to our Facebook, Instagram or Twitter pages with the hashtag #ibikedthebay and we’ll give you a free BCGP t-shirt! Make it the whole way and get a t-shirt and Circuit tote bag and we’ll make you famous: you’ll get your picture on the Biking The Suburbs Facebook page for a month. Just don’t let it get to your head. 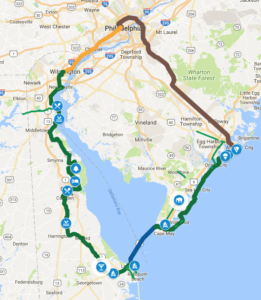 I have done a perimeter ride of Delaware Bay for the Perimeter Bicycling Association of America, going counter-clockwise. After I had made arrangements to get a lift over the Del. Mem. Bridge, I had obstacles to get across, so the trip nearly didn’t happen. I barely got the bike in the motel room in Bridgeton. I was at the trail between New Castle and Wilmington 2 weeks ago. It’s not completed yet. There was a man who got out of a car when I tried to cross a bridge. The ribbon cutting ceremony is 9/22. There will be a festival there and there will be 2 bike rides offered. You don’t need the train and the bus. Bike from NSQ, PA to Millville, NJ on Day One. Milliville to Dover, DE (via the CMLF) on Day Two and back to NSQ on Day 3. It’s about 225 miles total.